Paris in the spring. Not many places are more Romantic! time for shopping and enjoying the food! You know something is amiss when just reading through the list of what you want to do makes you tired. I suggest taking a different approach when visiting Paris (or any other city for which you have a sentimental yearning). If you have not been to the city before, schedule time for two or maybe three “must do” places. After all, you really should not come home from Paris without at least seeing some of these from the outside. But leave plenty of room for things on your own personal list for this city. And leave time and energy for surprising discoveries which you will eventually recall as the highlight of the visit. In the late 1990’s (years before the internet was a primary research tool for most people) I was talking with our son about Paris. I asked him what he would be interested in seeing there, thinking his high school French classes would have primed him for just such an outing. He said he would like to see Jim Morrison’s grave. “Excuse me? Oh. Well, I think that would make an interesting research project, just to find out exactly where it is,” I said, imagining something like a trip to the library. I didn’t think much more about it, but half an hour later he handed me a picture of the tomb of the lead singer of The Doors, printed from the internet. 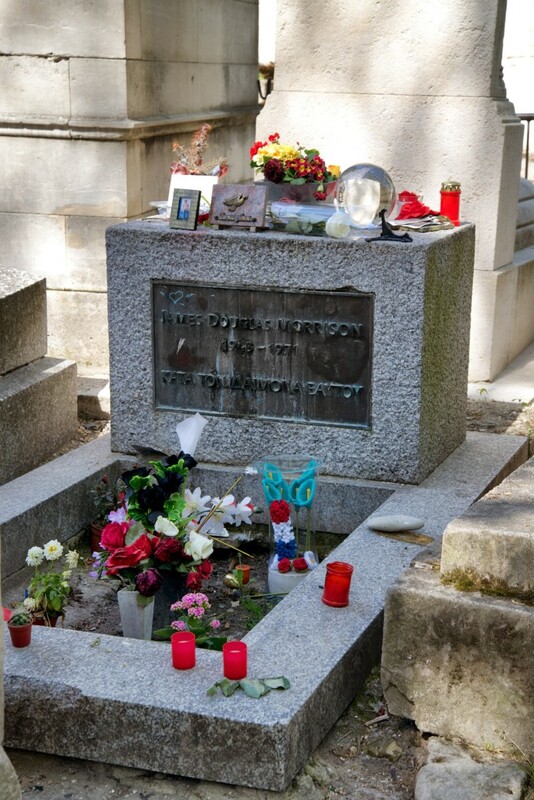 Grave site of Jim Morrison of The Doors, as it was last autumn. When I mentioned this incident to friends whose age is halfway between mine and our son’s, they said “Oh yes, it’s all marked up with graffiti and mementoes.” One friend had seen it herself; others had only heard about it. His plot at Père Lachaise cemetery is one of the most visited sites of the city and something of a liability for the cemetery. My point is that outing would have made the trip for my son in 1997 — and a moonlight cruise down the Seine would have been a good time for him to nap. When you visit a city, it is important to be sure you see YOUR city. In the category of surprising discoveries I have to tell you about the Musée d’Orsay. I turned a corner on the third floor to find a large painting I had never known about which just captured me. It was The Floor Planers (Les Raboteurs de Parquet) by Caillebotte. I could smell the fresh wood shavings. The workers (with their lean sweaty backs) seem to be chatting, perhaps deciding who will go after the next bottle of wine. I remember it as being much wider than its actual 146 cm. For some reason it had a huge impact on me, and it is my favorite Paris memory. There is a Paris for every visitor. The City of Light is “always a good idea” if you can take it as your own. The same applies to any other destination, of course, but only Paris had Audrey Hepburn’s Sabrina to present it with such charm! 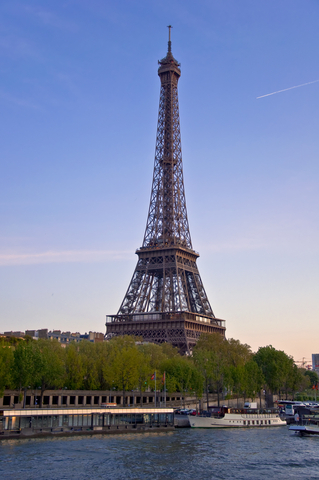 I would love to help you discover Paris or your own personal “good idea” city. Call me! This entry was posted in Travel, Uncategorized and tagged Audrey Hepburn, Eiffel Tower, Jim Morrison, Musee d'Orsay, Notre Dame, Paris, Pere Lechaise, Sabrina, The Floor Planers, travel. Bookmark the permalink.